The only good thing about his passing is that it provides me with an occasion to sing his praises. 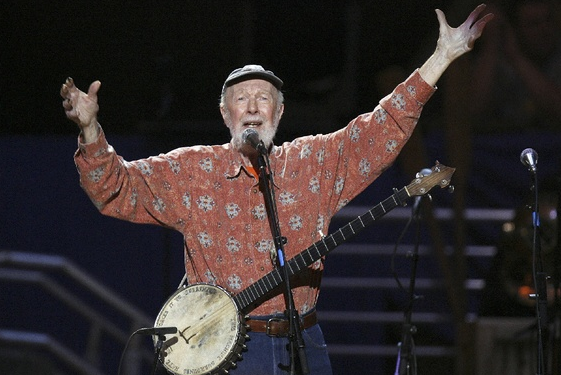 As a musician, storyteller, activist, and educator, Pete was a fascinating and phenomenal force of nature. Last September, I had the great fortune to see one of his last concerts in Peekskill, New York. In addition to singing such classics as “Where Have All the Flowers Gone?” he dazzled the audience with his rendition of “English is Crazy” which points out some quirks of the English language, such as “if a vegetarian eats vegetables, what does a humanitarian eat” and “why do we have noses that run and feet that smell?” For the whole song, go here. But I digress (yet another talent that Pete was good at.) Before I went to see Pete last September, I read through a fascinating book, In His Own Words, a collection of miscellaneous letters, articles, etc. that Pete wrote over his lifetime. Most surprising was an interview he gave to Seventeen magazine in 1963, when he was 44 years old. Well worth checking out! About eight years before that interview, when Pete was 36, he was asked to testify before the House Un-American Activities Committee. I loved reading the transcript of his testimony, which became public not too long ago. He humbly told the committee that he was just a “banjo picker,” and that he refused to answer any questions concerning his “associations, philosophy or religion.” Pete’s tenacity, wit, and integrity are so inspiring. Pete’s passion and joyful music holds a permanent place in my heart and soul. Bye, Pete. You’ll be missed! Posted in Catchall, Pete Seeger | Permalink | No Comments ». Add yours!